After a very lengthy, slippery & extremely soggy qualifying session on Saturday afternoon; thanks to a massive thundery downpour, we were left on Sunday with a bright hot summer’s day that beckoned 22 Formula One cars to get racing and do battle. With the heating building prior to the start of the race and track tempretures exceeding 50C, it was clear looking after the tyres was going to be a key part of the afternoon ahead. Prior to the start of the race Felipe Massa’s Williams was having steering rack issues which almost left him out of the race, but luckily the Brazilian took his place on the grid after the mechanics managed to solve the problem and have him race prepared. As the lights went out both Mercedes got very average starts, the Red Bulls of Daniel Ricciardo and Max Verstappen were keen to pounce on any mistakes made by the Mercedes cars. Heading into turn one Hamilton had to defend from Ricciardo and took the lead, on the exit and into turn two Ricciardo tried to fight Hamilton back but eventually lost out to Rosberg and had to tuck into third. Max Verstappen managed to keep ahead of the fast starting Ferrari’s of Sebastian Vettel and Kimi Raikkonen; but would soon face the pressure of the prancing horse later on. In the early laps Jenson Button had an issue with his brakes and hydraulic system, due to the pit communication rules he had to tour through the pits in order to solve the problem. Unfortunately his engineer told him over the radio some specific solutions he shouldn’t have done and this led to a drive through penalty for McLaren driver. As the first pit stops cycled through, it was clear Mercedes could still make a gap to Red Bull and have that performance advantage, unfortunately for Max Verstappen after he made his stop he found himself fighting with Kimi Raikkonen for the remainder of the race. For the first part of the battle it meant having to attack Raikkonen as the Finn was running an alternate strategy starting on the yellow marked soft tyre. 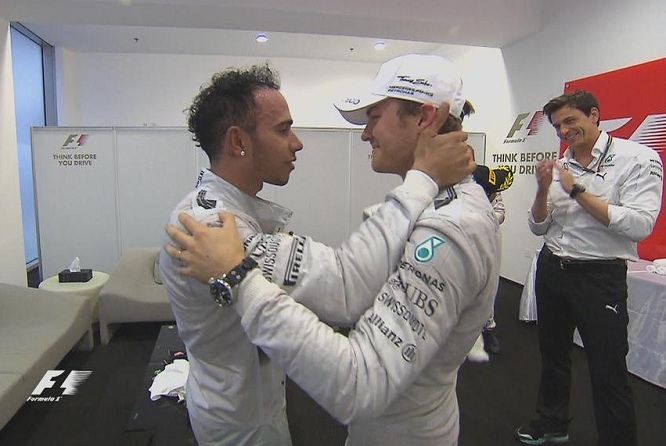 At this stage of the race Hamilton was losing time to Rosberg and at first it was unclear why, it turns out that he was trying to nurse his power unit without taking too much out if it knowing he needs to make it last as long as possible. This did irk the team slightly by asking him to pick up the pace because of proximity of Ricciardo to Rosberg, this included a threat to stop his team mate first. The second stops passed by and it was looking as if Renault’s Jolyon Palmer was going to score his first F1 points finish after a very unfortunate first half of the season, again his luck found him after spinning at turn four and the points opportunity slipped from his grasp, it’s still unknown if it was driver error or a electronics issue that caused the spin. As the battle at the front was hotting up when Ricciardo made his second stop earlier than the Mercedes drivers and was storming towards them at a fast rate of knots, but it turned out Red Bull jumped the gun as Mercedes stopped nearly ten laps later. When Raikkonen made his second stop, he managed to find himself behind Verstappen and led to a great battle between the two towards the end of the race. Traffic is always an issue at the Hungaroring and this race was no exception, Hamilton found himself stuck behind the Haas of Esteban Guttierez for a fair amount of the lap at one point and Rosberg managed to close massively. As Hamilton passed the Mexican. The Brit did give him the international sign of approval; it’s a shame to see this happen but this is what can manifest when tensions run high at the highest level of sport. The final laps proved frustrating for Raikkonen as he couldn’t utilise his fresher tyres to pass Verstappen, this led to many close calls and and unfortunate coming together in turn two and Raikkonen losing a significant portion of his front wing, this didn’t stop the battle mind you, it went down to the final corner in which Verstappen took the flag in fifth ahead of the Finn. It wasn’t the most thrilling race we’ve all witnessed admittedly, however it still didn’t disappoint. Lewis Hamilton put on a measured and professional performance to take the lead in the championship in 2016, he also clocked up the 48th win of his career which leaves him three behind four time champion Alain Prost. It’s just 5 days until the drivers back in their cars for the returning German Grand Prix at Hockenheim. So not very long for you all to get your next F1 fix! What Can We Expect From F1 In 2015? Now that we’ve entered 2015 it’s now time to look forward the coming season instead of looking back on the old, we have plenty to look forward to in the coming months. In 2013 McLaren announced that they would be re-uniting with legendary engine partners Honda, after their abrupt retreat from the sport at the end of 2008 it was hard to imagine them returning to the sport so soon, with the new hybrid engine regulations it seems that they’ve been tempted back into the fray of F1, It also appears that they are not coming back to just make up numbers on the grid. Honda have invested heavily into their new engine program as well as the McLaren team and have stated that they want to be winning upon their return, signing Fernando Alonso and keeping Jenson Button is the best line-up possible to do the job as well as I have said in a previous article. Honda wanted a big name signing to join the team and in bringing Fernando in certain has done that. We’ll have to see in winter testing if there are any signs of improvement from the Woking outfit. Towards the end of 2013 we found out Sebastian was leaving Red Bull Racing, his home since he was a young boy, it was confirmed nearer the end of the season that the poorest secret of all was that he was joining the Ferrari team alongside Kimi Raikkonen. With Ferrari in a massive state of rebuilding it would be hard pressed to imagine Ferrari fighting up the sharp end of the field, but with James Allison the chief designer finally developing the new car all the way through and massive restructurings in personnel with a new team principal in Maurizio Arrivabene and including poaching Jock Clear from Mercedes, Ferrari’s position on the grid this season will be a massive mystery, Sebastian’s idol was Michael Schumacher and he has said he would love to emulate him by helping rebuild Ferrari, question is. How long if at all will we see a Ferrari revival? 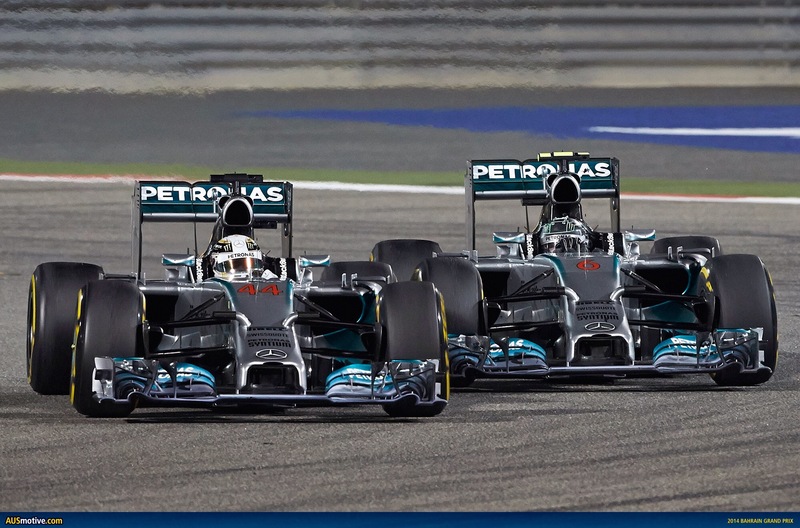 2014 saw Mercedes take the grid by storm in the all conquering W05, it was an engineering masterpiece that finally broke McLaren’s record of 15wins in a season, had Mercedes not have reliability issues they could have easily won all 19 races. It has been reported the Mercedes engine developers have said that they can find up to 60-100hp in the winter break for the new hybrid engines, this is an astonishing amount given the short time they have to achieve this. The W05 will also be evolved into the W06 this year, with any team always looking to improve the cars can the gap to them be closed down by anyone else or will the gap widen even more and leave Lewis and Nico to fight out the title once again? 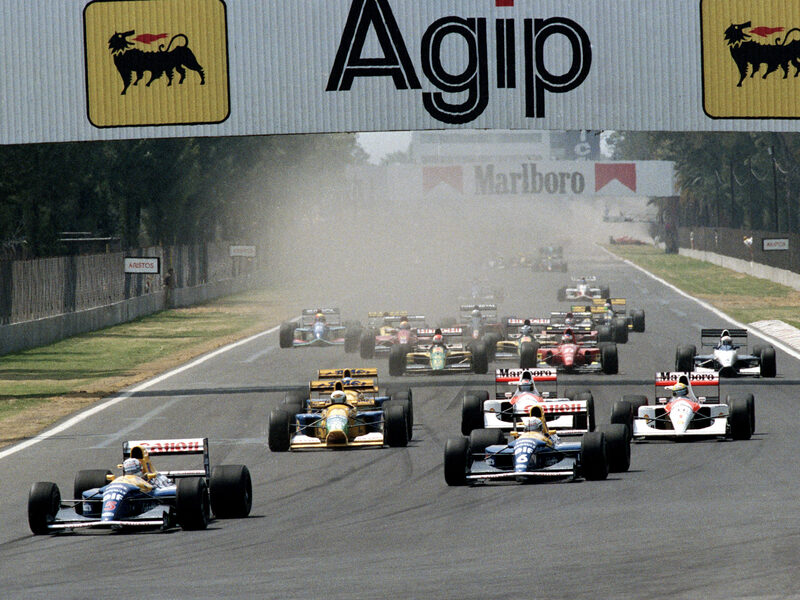 In 2013 we heard rumblings that the sport may once again return the to the Autodromo Hermanos Rodriguez, in 2014 we finally had it confirmed, the last race we saw here was in 1992 (see picture above) with Nigel Mansell won it from Ricardo Patrese and Michael Schumacher following him up to the rostrum. The circuit is very fast and flowing but was renowned for being very bumpy, with some funds being invested into the circuit to bring up to modern standards. I’m also hoping that while improvements have been made, the circuit will keep it’s traits and give the drivers a great challenge when we arrive for the event in the autumn. With Sergio Perez being the only Mexican on the grid for the race as Esteban Guttierez was ousted from Sauber, I would like to hope that Ferrari will give Esteban a Friday outing but with it being a new circuit I doubt that it may happen. It’ll be great to get all nostalgic once we arrive ready to begin a new future in Central America. With winter testing not very far away, like me I’m sure you’re all very keen for the action to get started once more, we can breathe a sigh of relief that the phallic noses are banned but we can also hold our breathe because the teams are only allowed to use 4 engines this season instead of 5 this means a huge undertaking for the engineers and designers, but it’s all part of the magical and wonderful world of F1 we all come back for time and time again. 69 days and counting until Australia.. Time is ticking! 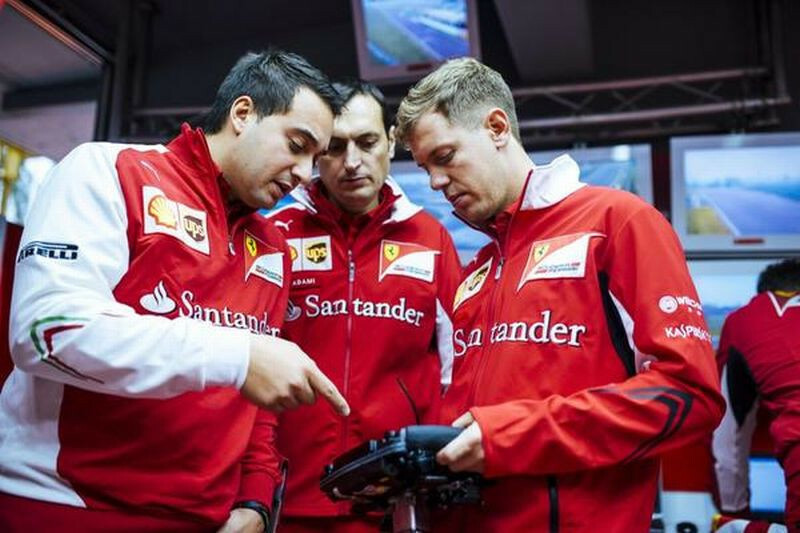 Posted in Driver Market, F1 2015, Ferrari, Formula 1, Honda, McLaren, Mercedes, Team Personnel, Technology, Uncategorized and tagged F1 2015., Ferrari, Formula 1, Honda, Hybrid, McLaren, Mercedes, Red Bull on January 1, 2015 by SteveCampF1.